If you have been dreaming of a private and well situated vacation or retirement home, look no further. This charming two bedroom home is located in San Luis on the central road into Tronadora. Tucked away in a quiet, friendly neighborhood, this six room cottage is on a 529 square meter lot and surrounded by luscious vegetation and a majestic view of the mountains surrounding Lake Arenal. Two additional lots come with the property of 470 and 1100 square meters respectively. The entire property totals over a half acre, or 2100 square meters, an absolute bargain for only $109,000. 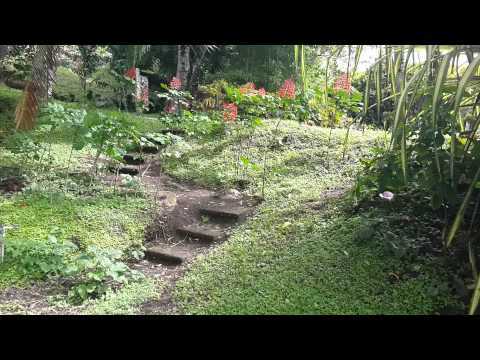 This cozy home is on the main road circling Lake Arenal and is ideal for commercial development. Realize your dream to own your own restaurant or bed and breakfast, and benefit from the easy access to public transportation only 15 minutes to the bustling Tilaran. The neighborhood is filled with a friendly melange of locals and expats. Take advantage of this affordable home tucked away in a natural wonderland.